The Irkutsk region is located in the south of Eastern Siberia, in Pribaikalye, in a pool of upper current of the Angara, Lena, Lower Tunguska rivers. The region has 767,9 thousand square meters (4,6 % of all Russian territory). The region includes 33 areas (raions) and 22 cities. 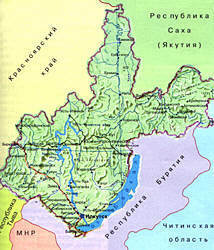 The Irkutsk region is larger than any Western European state. Its territory could place Italy, Denmark, Belgium, Great Britain, Portugal and Holland combined. The region borders on all subjects of the federation, included in structure of the Eastern-Siberian economic region: in the west - the Krasnoyarsk region, in the east - the Chita region, in the southeast and south - Republic of Buryatiya, in the southwest - Tyva Republic. In the northeast the border goes along Republic Sakha (Yakutia), which is included into structure of the Far Eastern economic region. The total extent of borders exceeds 7240 km, including on lake Baikal - 520 km. The significant stocks of gold and hydrocarbon raw material, rare metals, 47 kinds of precious and ornamental stones, iron, manganese, titan, mineral-building materials are concentrated on the regional territory. About 76 % of the territory is covered with wood; the stocks of wood make more than 11 % of all stocks of Russia. The Irkutsk region is the largest wood raw materials base of the country - second-largest after the Krasnoyarsk region. 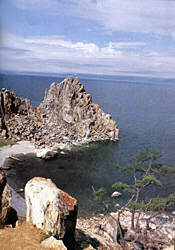 In 1997 the Irkutsk region marked its 60th anniversary.